With all of this snow outside, we have been making our own inside. 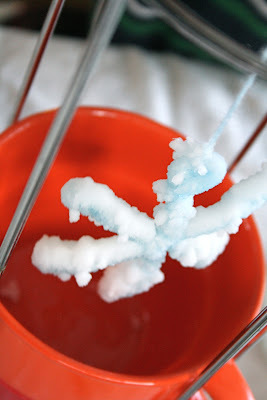 I'm sure most of you have made borax crystal strings or snowflakes before - but if you have not, it is a fun project for this time of year. 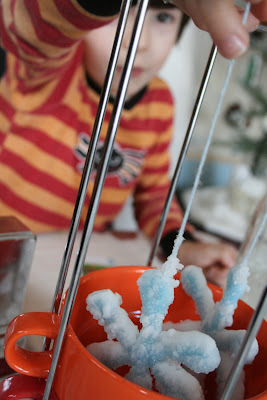 The boys first made strings of crystals, and then moved up to pipe cleaner snowflakes. 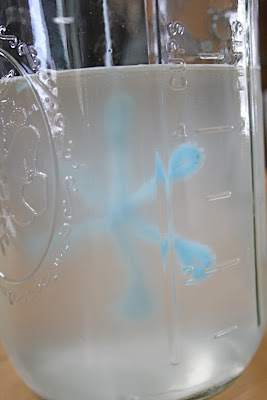 easy to make:: In a wide mouth canning jar, add 3 Tbsp of borax per 2 cups of boiling water. stir to dissolve. Make a shape using a pipe cleaner, and hang it from a pencil suspended across the jar mouth using a piece of yarn (don't let it touch the bottom). Be sure water is high enough to cover. Leave overnight. Pull out and let dry. Once dry, carefully hang in a window! Lots of fun. How cool! It looks like the hore frost that is currently covering EVRYTHING in our part of Alaska!!! We'll have to give this one a try! And thanks for the movie recommendation in your side bar! I've never done this. We'll have to try! Yours have come out much nicer than mine. For some reason my snowflakes turn into big blobs of crystal. I usually save this project for a snowday in January. We haven't done it in a year or two, so maybe I'll pull it out again! Love it. There's something so great about making your own snow or snowflakes. I don't think I've ever seen borax snowflakes before. that's the fanciest holder i've ever seen!! 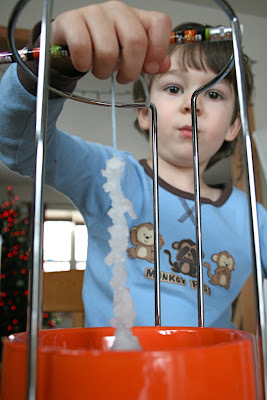 I loved the borax crystals when we did them, as you probably know. Infinitely better than the salt or sugar ones, to me! That looks great. The kids and I will try it--it fits in my "easy enough even for me to try" category! Oh these are awesome...I just love that with all the snow, the shoveling, etc...you can't get enough snowflakes...so you makes some to have hanging around the house...fun!!!!! I love those snowflakes. J and I will have to give it a try. Thanks for the idea! Happy Holidays! Those are great! We've done before but not snowflakes, what a great idea, especially for this time of year! We did those last year, they are really beautiful! Thanks for the reminder...we shall try that. Kade will absolutely be fascinated! Thanks, again! Incredible! We must give this a try! These are really beautiful. I'm visiting from Barb's blog. 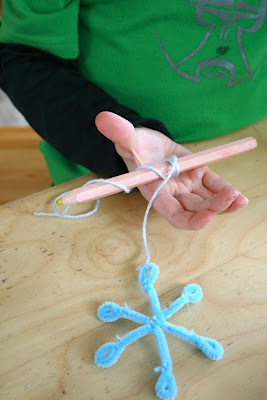 THis on my winter craft list - hoping to do it next week! where i can buy borax? is this product a toxic stuff? No, borax is not toxic. We use it here to make our own eco-friendly cleaning supplies. It is mild. i tried this last night, we must have done something wrong because there are only a few little crystals on the string not the lovely clusters you have. i guess i will just have to leave it a little longer and see what happens. Leslie - So you are doing a string, not the snowflakes? If so, give it a stir, and tie a paperclip at the bottom of your yarn/string (not touching the bottom of the jar). That should help! thanks...they actually started to get these beautiful clear crystals as the day wore on. perhaps i was a little impatient. we have been staring at them all day. every time we turn our back and look again they have sprouted more. i think my kids hoped if they sat there long enough they would see one appear! And through a magnifying glass is awesome. are these the kind of thing that could be made, hung on the tree and then put into storage for the next year? or are they going to break down, etc? we are considering doing them for a kids ornament exchange that we take part in every year. Looks like fun! I am a preschool Teacher and would love to do this as a ornament for Christmas.. Im just trying to figure out what I am going to put them in over night since I will have a whole class of them! Hi! I am Denise, mom to two free spirited boys. We spend our days living creatively and mindfully, unschooling, following our passions, eating locally, creating our life -- and having fun. ♥ Thanks for visiting! This is a Flickr badge showing public photos from MominMadison. Make your own badge here. Please do not use my words, photos or images without my permission. Thanks!